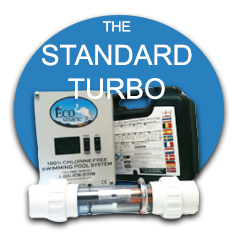 Systems for pools, spas and water features. EcoSmarte has proven to be a GREAT addition to our line of products because of the quality of the water that it provides for our pool owner clients without the use of harsh chemicals or salt! The company is genuinely credible and awesome in customer support! We are honored to represent EcoSmarte. For pools, we utilize Glasspack Filter Technology and the EcoSmarte system together to bring you that AMAZING swimming experience you and your family have been looking for! The EcoSmarte system, A manufacturer of the “best” non-salt, non-chemical water technology for the whole house, swimming pool, spa’s and numerous applications for commercial water. Tired of seeing your pool affected by harsh chemicals? Handles up to 50,000 Gallons, you can select “IONIZE” or “OXIDIZE.” The Standard Turbo generates low DC voltage amperage to electrodes and the unit ALWAYS remains in oxidize, unless copper ppm fails below 0.4 ppm! 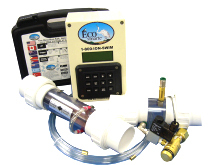 Handles up to 50,000 Gallons* comes with a digital display to FULLY automate your EcoSmarte pool with CO2 PH control. The higher daily bather loads require additional equipments and installs to 50,000 gallons. Uses finely crushed recycled glass for pool, industrial and environmental filtration that provide OUTSTANDING water clarity and quality – a direct replacement for sand or ZEOlite in both freshwater and saltwater pools. Glass Packs® from ECOsmarte® is now certified to drinking water standards by the Water Quality Association. The Good Water Guy offers you a PROVEN system to use NO regular chemicals or salt in your pool! Our fresh water pool offers you every benefit found with a salt water pool with none of the negatives. What began as a product for chemically sensitive, cancer aware or environmentally conscious consumers in 1994, has evolved to a proven product with installations in all 50 U.S. States and over 100 Countries! Salt water chlorine generators have created a demand by consumers to stop handling chemicals and The Good Water Guy delivers an affordable device that actually takes the swimmer out of the high amperage, acid and salt. Our products are supported by a growing network of swimming pool builders, in-home business entrepreneurs and conventional water treatment professionals.